We had reported last week about the US Copyright office legalising ripping of DVD’s and Jailbreaking into smartphones. Looks like the hackers took that part a little too seriously and released the iPhone 4 Jailbreak software that allows users to install applications not approved by Apple on to the iPhone 4. 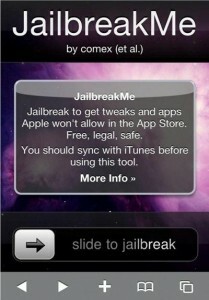 The software called JailbreakMe 2.0 can be downloaded and installed from its website jailbreakme.com. The installation is done via the safari browser and is simpler than traditional jailbreak software. Comex, one of its developers, wrote on Twitter that there were initial issues with JailbreakMe but those issues were now resolved. The new Jailbreak software is completely painless to use. Just go to www.jailbreakme.com and “slide to jail break”. This will be followed by the software downloading the jailbreak software and loading it up. It is expected that this time, a lot more people will use the jailbreak just because of the ease of process. The practise of jail breaking was considered illegal until last week when the Librarian of Congress issued a batch of exemptions ruling that the installation of legally acquired third-party software on mobile phones doesn’t violate U.S. copyright law. The jailbreaking also allows other networks to be used on the iPhone. Apple however issued a statement that jailbreaking the phone will interfere with its normal operation and that it voids iPhone 4’s warranty. Previous World’s most Expensive Car Wash!